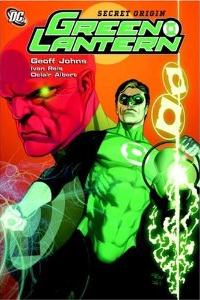 This week on The Bookshelf: Green Lantern Secret Origin! I’m continuing to delve into the DC Universe, and I get to prep myself for the upcoming movie (which looks awesome by the way). As I’ve said before, I haven’t read too much from the DC, and even less about the Green Lantern. About all I knew was that 1) he had a green lantern 2) there was a lot of green lanterns, and 3) their weakness is the colour yellow. After reading this, I’ve found out why The Green Lantern has been around as long as he has. He’s a pretty cool character! I’ve already picked up Green Lantern Rebirth and am looking forward to reading more about him going forward. 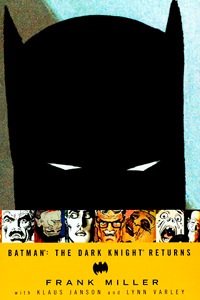 This week on The Bookshelf… Batman: The Dark Knight Returns! I’ve started reading some more DC comic recently, so I picked up one of Frank Miller’s books. This book i son numerous “Best Graphic Novel” lists, so I thought I’d check it out. I wasn’t disappointed! There’s a reason why Frank Miller is such a big name in comics. The story takes place 10 years after Bruce Wayne has hung up the cowl and stopped being The Batman. He decides to don the cowl once more and bring order back to Gotham City. Bruce battles crime despite his aging body and fights to make Gotham a safer place. I found one really interesting thing while reading this though. I don’t know if it’s because of me doing the strip every week, but this story would work as a comic strip. Every 3-5 panels could easily be a strip, with minimal reorganizing. Maybe its just me… Anyone else notice this? This week on Adventures in Cartooning… a retrospective. I thought I`d share a peek back at the history of The Superpower Union. 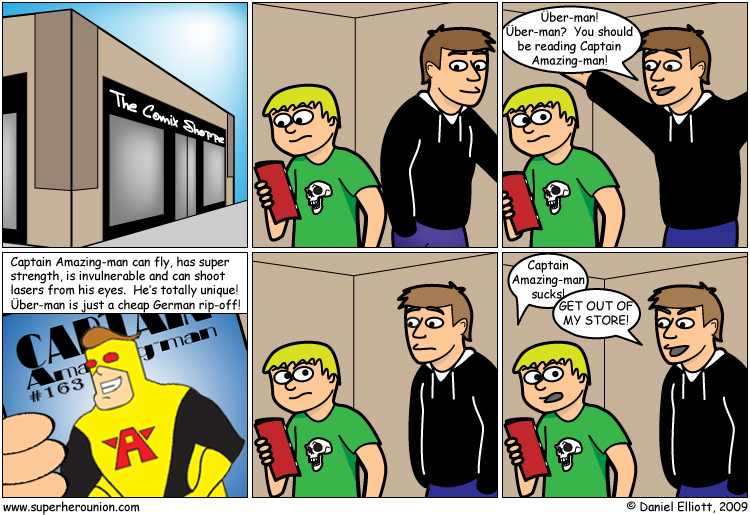 It didn’t start out as a webcomic (more on that later) and it didn’t turn into a hand-drawn strip until much later. I had made an attempt to make it using vector graphics. Anyway, back on topic! The Superpower Union was a vector created strip at one point. A point that lasted about 4 strips before my free trial of Illustrator ran out (or a gave up… not sure which one really happened anymore). Cap hasn’t really changed since then, but Gary got a major make-over. So here’s a peek at the first strip in all it’s vectorized glory*! * the term ‘glory’ may be used in a sarcastic manner. They say an artist is always their own worst critic. That’s probably very true. Very, very, very true. I wish my work was better no matter what anyone else says, and I’m coming to think that maybe that’s a good thing. It pushes people to be better and to grow. I’ve been experimenting with different ways of producing this strip lately, and one of the methods I’ve tried is using brush and ink to do it. I been following Doug TenNapel’s (creator of Earthworm Jim) webcomic Ratfist, and a few weeks ago, he posted a video of him painting a Ratfist comic. I say painting because he’s using a brush better suited to painting a house then inking a comic. Seriously, the brush is as big around as my finger! I wish I was capable of creating work that good with something as simple as a brush and a bottle of ink. Then I thought ‘why not try it?’. So I picked up a brush for a couple of bucks (one very similar to the one in TenNapel’s video) and thought I’d give it a try. Results the first time around were decent, but killed my wrist. I decided to scour the internet for some more information on how to ink with a brush. I tried some more, with much the same results as before. However, even though the work wasn’t as good as a micron/brush pen (what I’ve been using in the strip), I had a weird sense of pride from the work. I enjoyed learning a new medium and method as much as anything, and wanted to do more. It’s doubtful I’ll do it on the strip much in the near future, but is a method I’ll probably use once in awhile on other artwork. 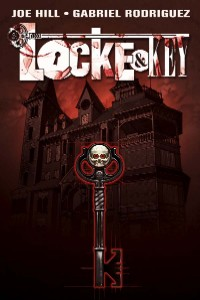 This time on The Bookshelf… Locke & Key Volume 1.